This one has been the talk the town for the past few weeks.. 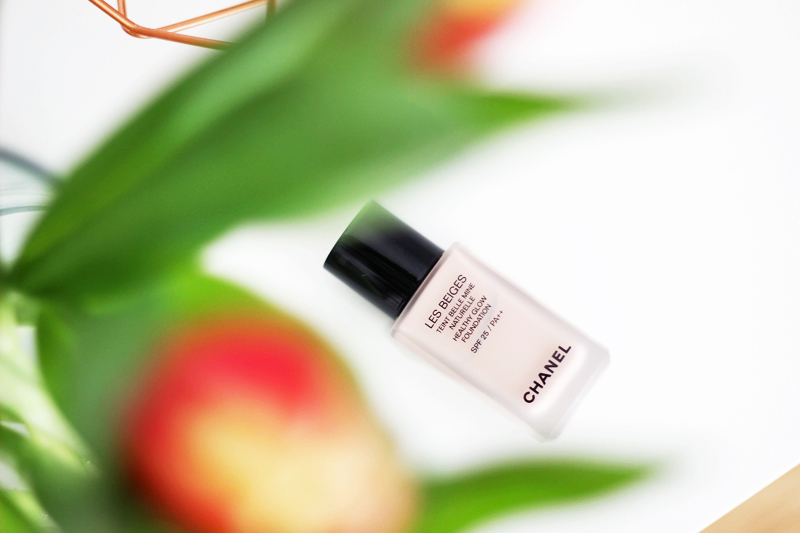 Enter Chanel Les Beiges Healthy Glow Foundation. When Chanel launches a new foundation, you know beauty fanatics will be eagerly waiting for its launch. From the first pictures I saw surface in november '15 to the moment it landed on my desk: it was an exciting wait. I thought of this one to be a very sheer, super dewy type of foundation but now stand corrected: this gives you a healthy glow but with that full type of coverage that I absolutely love and often need. I'm a big fan of the Les Beiges range (see the Multi-Colour Powder, the Sheer Glow Powder & the CC Cream) and besides the great results also really love the look and feel of the range. So here I am with my arms wide open, welcoming this one into the happy Les Beiges family. I have combination skin that can be tricky to work with - when I get oily I tend to do so on my forehead, around my nose and on my chin, so those are the exact areas where foundation seems to move around and finally just downright disappear. Foundations for oily or combination skins often seem a little heavy and while I don't dislike the look (I am a huge fan of Estée Lauder's Double Wear, for example) I have been using luminous bases underneath those foundations to add a little bit of glow. 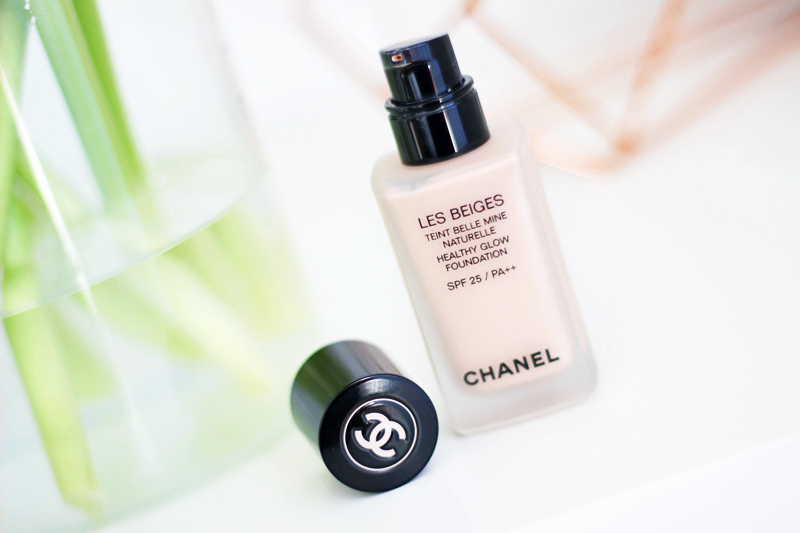 The perfect way to describe Chanel Les Beiges Healthy Glow Foundation is to say that it's the combination of both in just one product: it's quite heavy, provides full coverage & still holds a pretty radiant finish while feeling matte enough to skip the setting powder. I think this one would actually suit all types of skin, as long as you use the appropriate moisturiser underneath. Can we talk about that coverage?! It's amazing, I was definitely not expecting this level of coverage! 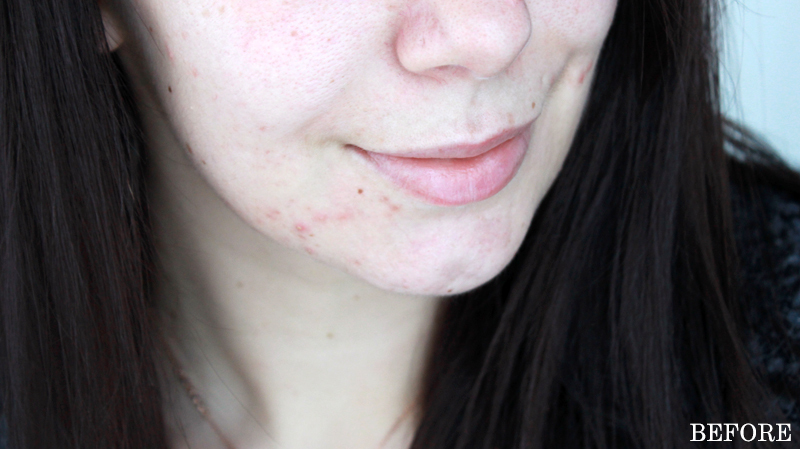 It almost perfectly conceals all of my active acne, has completely covered my darker acne scars and also concealed pretty much all of the redness around my nose and on my cheeks. This is definitely what I call a full coverage. You could use it a little more sparingly and go for a medium coverage look - I just applied it like I normally do as I don't like my acne to peep through when I am wearing a full face of makeup. I wore this with just a tiny bit of powder on a weekend day at home and found that it didn't budge for the whole time I was wearing it. It felt very comfortable too - not drying at all but not overly thick either. I haven't worn this one out for a full day to work, but I suspect that I'd only need to touch up my chin area a little as that is the area I tend to touch the most throughout the day. As you can see I am not wearing the right shade - I am wearing the shade 12 Rose in this picture. I was surprised to find this one too light and too cool toned for my skin. I'm not sure if this is an explanation at all, but I noticed that the pink based shades for this foundation are called Rose instead of Beige Rose like with the other Chanel foundations. 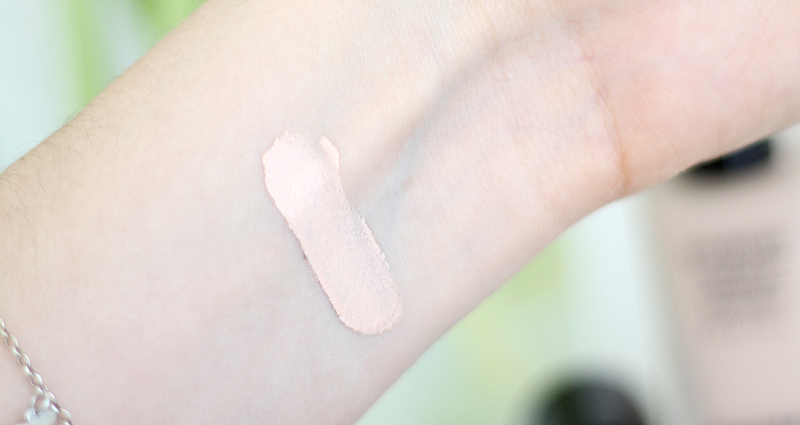 For reference I do wear the shade 12 Beige Rose in Chanel's Perfection Lumière Velvet Foundation (review with swatch here). I sadly don't have that foundation around anymore so I can't do a comparative swatch, but I think that one has more yellow tones in it. This is great news for those of you that have a true cool toned skin - definitely look into the Rose shades as they might be your perfect fit! I should probably use shade 10 Beige or 20 Beige for this Healthy Glow Foundation, I will check out the other shades in store as soon as I am around an Ici Paris XL. As the foundation has a healthy glow effect, the effect is actually meant to be a little more pink ("healthier") than your regular foundation. This is achieved thanks to the light interacting with the natural minerals in the foundation. You can opt for the Rose shades if you're really into this effect, or opt for Beige if you like the effect but don't want to go over board. I really hope 20 Beige will suit me as it's the palest beige shade sold in Belgium, but I do have high hopes for it as my blogging friend Lisha told me it suits her quite well & I think we're about the same level of pale. I'll keep you posted on that! So would I recommend you to hit the Chanel counter to check this one out? Yes. Definitely yes! I love the coverage, finish & formula of this one. I'd highly recommend it for anyone with scarring or pigmentation spots as this will do the job & cover them all. If you're more of a sheer coverage type of person this might not be for you though. And let's not forget it also holds a pretty high SPF25. I'm not very sure about the shade range as there are just eight shades available in Belgium (a few more overseas), so the only way to find out whether you have a perfect match is to hold a little swatching fest at your usual Chanel beauty retailer. I sincerely hope you do!